J. W. Carmichael & Company of New Glasgow, Nova Scotia. 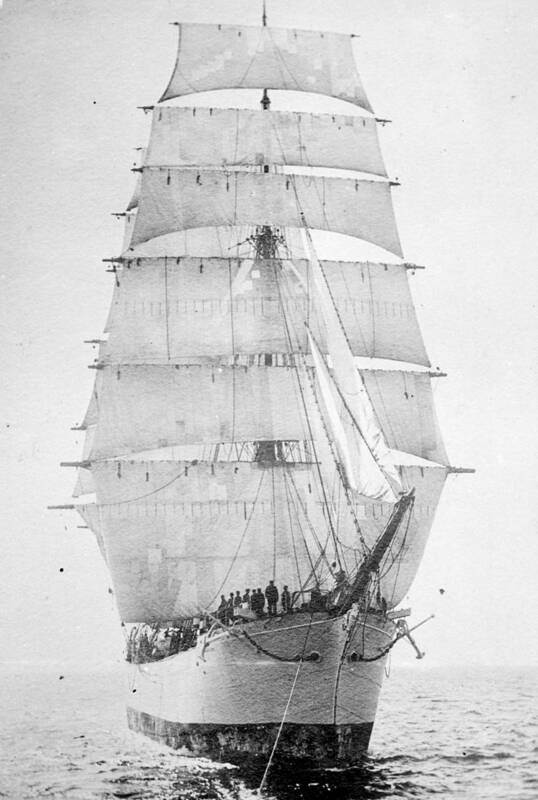 The 232' long ship, classed 100 A1 by Lloyd's, was of 1,505 gross tons and christened by Mrs. J. Albert Black. The ship was described as having "superior accommodations for captain, officers, passengers and crew" and having the "best appliances for working ship and for loading and discharging cargo." Her first master, Richard Meikle, took her from the builder's yard to Nova Scotia and turned her over to her owners in May or June of the same year. In April of 1905 while in Sydney, Australia fourteen of the crew were arrested for "combining to neglect duty", apparently the crew felt that the ship was unseaworthy and demanded to put into port for repairs. Subsequent inspection of the ship did not reveal any deficiencies and the men were imprisoned for twelve weeks. By mid 1915 sailing ships were in big demand since so many steamers had been taken up for war use, the number of steamers being sunk was also a factor. Cotton and grain were commodities which were in high demand in Europe, and American sailing ships were being hired to carry it. The sailing ships and their crews were under considerable pressure to move their cargoes and return for another load, the possibility of being detained by the British or the Germans could extend their voyage, sometimes considerably. Brynhilda was one of the ships being employed for this purpose. The ship was registered in New York in 1914 and owned by the Brynhilda Shipping Corporation of New York, a company which may have been a shell corporation for the German government. On Feb. 19, 1915 Brynhilda, under the command of Captain Duffy, sailed from Pier 27 at New York for Bremen, Germany with a cargo of cotton. Preceding her was another ship, the Pass of Balhamas, also sailing for Bremen with cotton. Somewhere in the waters north of the United Kingdom Brynhilda was stopped by a British warship, perhaps of the 10th Cruiser Squadron, which was charged with the job of searching ships bound to and from European ports for contraband. A prize crew was put aboard and the ship was taken into Aberdeen to be searched. A German report stated that the British put a well armed contingent of marines on the ship with the intention of engaging a German submarine if stopped. The objective, according to the German report, was to shoot the U-boat captain and render the submarine unable to dive. The report also claimed that captain Duffy protested the British presence and he threatened to make for Norway. It is true that hundreds of ships were stopped, many being taken into port to be searched, a number of them were found to be carrying contraband, but the accusation that the ship was also armed by the British is absurd. Small arms were carried, but no gun that could threaten a U-boat could have been transferred or mounted on these ships. Brynhilda was finally allowed to sail from Aberdeen on Mar. 26 since she was found to have sailed from New York before the blockade was announced. She made for Bremen, unloaded her cargo and left that port in mid April. Her next voyage was supposed to take her from New York to Arkhangelsk (Archangel), Russia, again carrying cotton and again the Pass of Balhamas sailed before her, also bound for Arkhangelsk with cotton. The Pass of Balhamas would never make that port because she was stopped by a British cruiser and had a prize crew put aboard, but before making port a German submarine captured the ship and took her to Cuxhaven. She was converted into the auxiliary cruiser SMS Seeadler (Sea Eagle) and became one of the most famous German raiders of the Great War. Brynhilda also did not make port in Russia, on June 10, 1915 a fire broke out in the ship's hold while at Pier 26. The fire was extinguished by the local fire dept and two fireboats, but it had caused $35,000 in damage. I don't know how long it took to repair the ship or what her activities were for the rest of the war, but in the later stages the war sailing ships were still in high demand, this of course was due to the incredible number of steamships that had been lost. In 1918 Brynhilda was now owned by the Cosmopolitan Steamship Company of New York and was back in sailing trim. On September 27, 1918 she set sail out of New York with $1,000,000 worth of general cargo and deck lumber bound for Africa. The master, Captain F. E. Kennedy and the twenty men expected to be in Africa by Christmas. For Kennedy this was his first voyage as master of this ship, but he had made at least three voyages during the war as master of the schooner Scotia. On Sept. 29 a lifeboat which still had part of the davits attached to it, was found by a U.S. Navy ship, the lifeboat belonged to Brynhilda. Further searching turned up lumber and other wreckage which belonged to the ship, but no survivors. No distress signal had been picked up from the ship and it was assumed she was lost with all hands. On Christmas Day however Captain Kennedy was eating his dinner at Algoa Bay, Africa, just as he had planned. The ship had arrived on Dec 20, and a message was sent by Lloyd's on the 26th announcing the safe arrival of ship and crew. Brynhilda was finally scrapped in the mid 1920s after a somewhat colorful career. Brynhilda, date and location unknown.